by Scott McCloud. Since then, a few of our colleagues at Google created a simple explanatory website called WhatBrowser.org when they realized that many of our friends and family weren’t sure what web browsers are. Today, we’re very excited to release a special project called “20 Things I Learned about Browsers and the Web.” In the spirit of Chrome’s tradition with books and HTML5 experiences, we teamed up with illustrator Christoph Niemann to publish an online guidebook to browsers and the web, written by the Chrome team. If you have questions like “What are plug-ins?,” “What is HTML5?,” or even “Why is it ok for a truck to crush my laptop?,” “20 Things” is a handy guide for anyone who’s curious about the basics of browsers and the web. 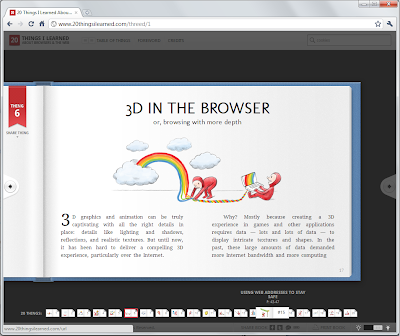 So grab a cup of hot chocolate and enjoy this illustrated guidebook in Chrome or any up-to-date HTML5-compliant browser. Once you’ve loaded it in the browser, you can even disconnect your laptop and read comfortably in your favorite armchair since this guidebook works offline, thanks to HTML5. You can also jump directly back to the page at which you’d previously left off, search for topics that you’d like to read up on, or even view it in “lights off” mode (remember reading under the covers with a flashlight?). If you’re on Chrome’s beta channel, you can give the Chrome PDF viewer a test drive in the “Print book” section of the guidebook. To read this online guide, go to www.20thingsilearned.com, (or you can use this shortened URL: goo.gl/20things.) And to learn more about how we made it, you can read about the technical details on the Google Code Blog. On the Chrome team, we’re always looking for new ways to communicate complex concepts about technology. More than two years ago, we launched Chrome with a comic book by Scott McCloud. 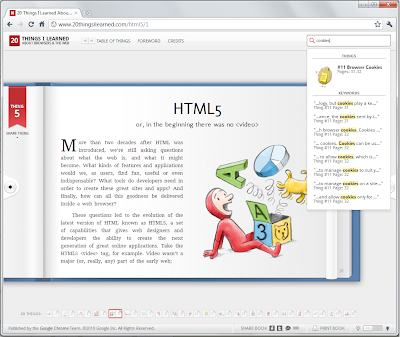 Since then, a few of our colleagues at Google created a simple explanatory website called WhatBrowser.org when they realized that many of our friends and family weren’t sure what web browsers are.